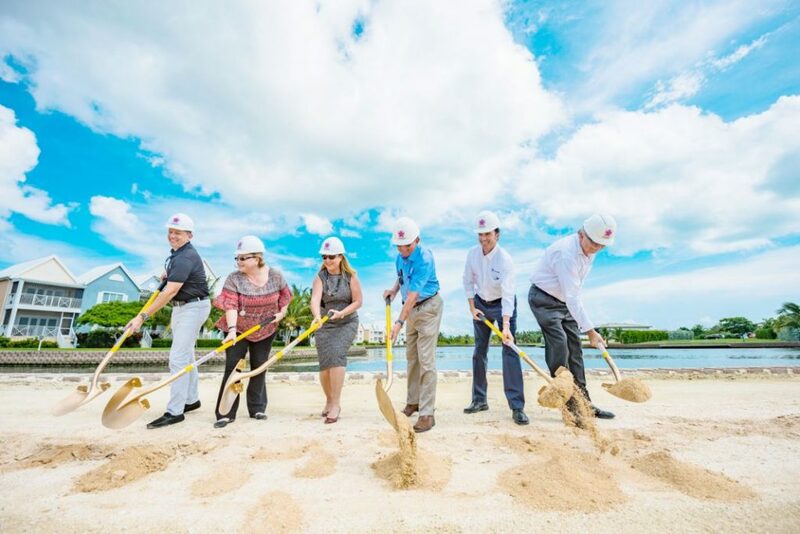 Construction is set to begin Monday on the Periwinkle housing development, a project in Grand Harbour that aims to be Cayman’s first LEED (Leadership in Energy and Environmental Design)-certified community. Developers pegged the cost of the project at $80 million. Between the end of next year and early 2019, 24 homes will be completed, project manager Ryan Ostendorf said at a Periwinkle groundbreaking ceremony on Wednesday. Eventually, there will be a total of 20 cottages, 28 courtyard town homes, 23 waterfront town homes and 10 luxury villas, as well as a 60-foot swimming pool, a clubhouse and other amenities. While there are other LEED-certified buildings in the territory, Periwinkle will be the first neighborhood where every unit has that certification, according to Mr. Ostendorf. The LEED-certification – an internationally recognized rating for environmentally friendly buildings – for all the development’s units will mean big savings on utility bills for homeowners, he said. The homes will achieve those savings by having features such as energy-efficient air-conditioning systems, Energy Star-certified LED lighting, low-flow plumbing fixtures. Solar power will be the primary energy source for the community’s homes, streets, docks and amenities, according to Periwinkle. The community’s green areas will be landscaped with drought-resistant plants – including, of course, the periwinkle – which will further promote water conservation, he said. Homes will start at $500,000 and go up to around $1 million. Minister of Finance and Economic Development Roy McTaggart was also at the groundbreaking, touting the fact that the territory’s strong economy is able to support such an ambitious project. Mr. Ostendorf said there will be 15 to 20 workers on site Monday, beginning work on the project’s infrastructure. During the “peak” construction phase, around 200 workers will be employed on the project, he said. Periwinkle Ltd. is chaired by Heber Arch, whose firm Arch & Godfrey is also building the development. The project is funded through a combination of private individuals and a loan from the Cayman National Bank, according to Mr. Ostendorf.